Stack a few slices of the prosciutto together at a time. Roll the slices up and cut thin slices from there. Using your hand separate the pieces up a bit after cutting. Heat a large pot, over medium low heat, and add in about ¼ cup of olive oil. Add the prosciutto and brown until crisp. Remove the prosciutto with a slotted spoon and place aside. To the oil go ahead and add the onion, garlic, oregano and a little salt and pepper. Cook until softened. Add in the pureed tomatoes and simmer, stirring occasionally, for about 30-45 minutes. Lower the heat at the end of the cooking time and stir in the light cream and peas. Cook for a few minutes, until the peas are warmed through. Cover. Cook the tortellini to al dente according to package. Drain and toss with the sauce. Serve the crisp prosciutto over top. 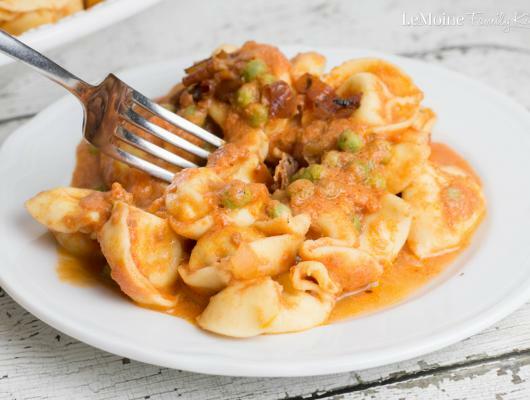 With just a handful of ingredients, this Tortellini in a Tomato Cream Sauce with Peas & Prosciutto is an elegant yet simple weeknight meal. 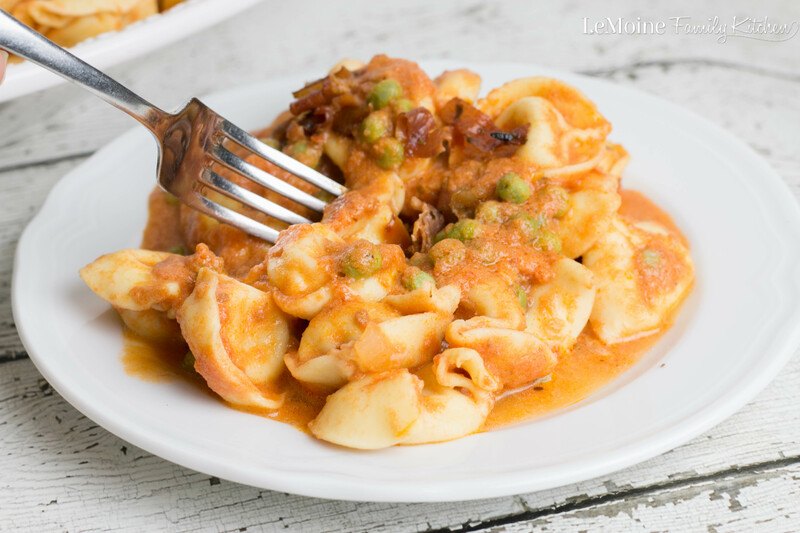 5 cheese tortellini tossed in an easy tomato cream sauce, some frozen peas and topped with crisp prosciutto… this is what I call Italian comfort!